- Mario and Luigi hats. They were $2.50 at Walmart and I just pained on the letters. I only got one for the birthday boy and little brother. If you're working with a bigger budget you could get one for all of your guests. 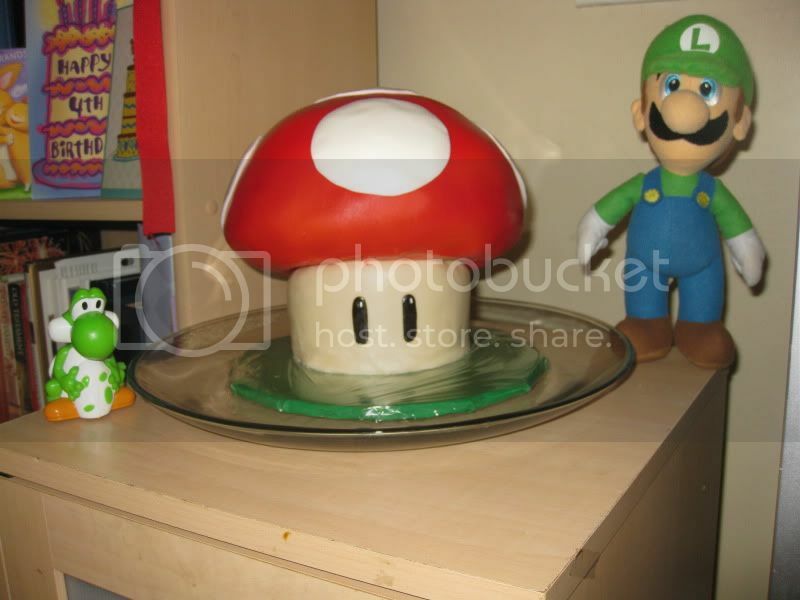 - Use things we already had that were Mario themed: my son sleeps with this Luigi EVERY night and I found the little yoshi at a yard sale for .10. - Cut out paper mustaches for everyone at the party. If you've got more money you can buy some Fun Fur and make furry mustaches. We just taped them on. - We decorated with red, blue and green streamers and table cloths and balloons. These were all from Dollar Tree. - A friend from college was back in town visiting family and contacted me about making the cake. Normally I would have just done a simple cake...but she wanted to do it and I was more than thankful that she did it. It was amazing and she very graciously only charged for ingredients. - Simple snacks for us! $1 pretzel sticks and animal crackers and $1 star shaped marshmellows. We just had juice and water to drink. We had our party in the evening so no one was expecting a meal. Had it been a little cooler I would have made pizza! - Bowser shoot out: Print out pictures of Bowser and tape them to old throw-out chop sticks and stick them in the ground. Then get a pack of $1 water pistols at the dollar store. - Yoshi Egg Hunt: Use old easter eggs and put the little pricing dots you use for yard sales all over them. Get a small pack of chocolate gold coins for the kids to have in the Yoshi eggs when they found them. - Bomb-omb hot potato: You can use a nerf ball painted black as the "bomb-omb" and the kids play hot potato with it. - And of course, have the Wii going! If you don't have a Wii, you could probably get ahold of an old NES system from SOMEONE for the evening. 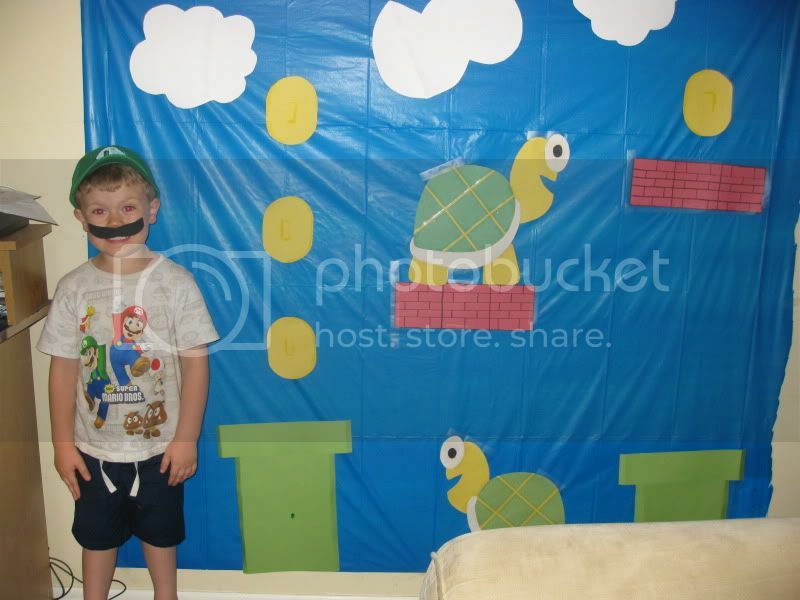 My husband made this super cool background for the kids to play Mario on (and we had the Wii going, of course!). The background is just a $1 tablecloth from Dollar Tree, construction paper and and scrapbook paper (that I was never going to use). My son adores it and we'll just move it into his bedroom when it's time to take it down from the living room. I hope some tips help for you to have a super-fun Mario Party of your own!